New Jersey is poised to legalize recreational marijuana after a pro-cannabis candidate won the state’s gubernatorial race Tuesday night, giving the MJ industry a potentially huge win in what could be a lucrative new market for businesses. Come January, the notoriously anti-marijuana Gov. Chris Christie will be out of office and Democrat Phil Murphy will be in. If Murphy makes good on a campaign pledge to legalize adult-use marijuana – possibly as soon as his first 100 days in office – New Jersey could become the biggest recreational market on the East Coast and easily generate hundreds of millions of dollars in retail cannabis sales annually. Also on Tuesday, voters in Detroit approved two marijuana-related measures that could benefit both existing and future MMJ businesses. 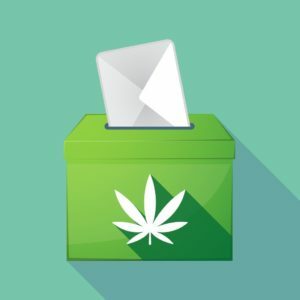 The election of a strong MJ supporter as New Jersey’s next governor is “a massive deal,” said Evan Nison, a longtime cannabis industry insider and New Jersey United for Marijuana Reform committee member. “I’ve said for a little while now that I think it’s possible that northern New Jersey could be the largest cannabis industry per capita in the world, at least while New York and Pennsylvania take their time to legalize,” Nison continued. Murphy’s victory could be significant for another reason. If the Democrat-controlled New Jersey Legislature can deliver a rec legalization bill to Murphy’s desk not long after he takes office in January, the state will become the first in the nation to legalize adult-use cannabis via lawmakers as opposed to the ballot box. “The governor was the only thing stopping legalization up until this point, and we’ve said since Christie was elected that we’re been waiting for him to leave,” Nison said. The New Jersey CannaBusiness Association also celebrated Murphy’s victory. The legislature already has a rec legalization bill teed up – S3195, which state Sen. Nicholas Scutari introduced in May – but Nison said there likely will be further negotiations before a measure is passed by lawmakers. “I’m not sure what the final legislation will look like,” Nison said when asked if he thinks New Jersey would take a more free-market approach with no business license caps, or if lawmakers would be more inclined to limit the number of recreational cannabis permits. For instance, Scutari’s bill includes a provision calling for “at least one marijuana retail store per county,” but it’s unclear under the legislation whether all businesses that qualify will be licensed. Nison believes the legislature will be more inclined to open up the market instead of allowing, say, only the six licensed medical cannabis producers in the state to sell adult-use marijuana. He also cautioned that it’s not a given that New Jersey will legalize adult use, though he put solid odds on Murphy signing off on a landmark rec bill. “I think it is 50-50 on if it’s the first 100 days. I’d say 85%-90% likely it happens this session,” Nison added. What is certain, though, is that marijuana will be a hot topic when the New Jersey Legislature reconvenes after Murphy formally takes office. Marijuana entrepreneurs got another win Tuesday in Detroit, where voters gave the green light to expand the number of locations available for medical marijuana dispensaries. According to WDIV, Proposals A and B – municipal ballot questions to opt Detroit into the state’s MMJ regulatory scheme and to loosen city dispensary zoning – passed handily. The measures will roll back a restrictive ordinance established last year by the city council that forced most Detroit dispensaries out of business. After the ordinance took effect in March 2016, the city shuttered 186 of 283 dispensaries, the Detroit Free Press reported. Those closures came about largely because dispensaries were prohibited from locating within 1,000 feet of schools, churches, day-care centers, parks, libraries, public housing projects and other dispensaries, leaving few areas in the city where dispensaries could legally set up shop. Currently, nine dispensaries are licensed by the city and are operational, according to Detroit city data. Another 65 are operating while awaiting permits and 90 more are undergoing the licensing process. New York voters appeared on the verge of rejecting a proposed constitutional convention that could have opened the door for a statewide ballot measure in 2019 on whether to legalize recreational marijuana. As of early Wednesday morning – with roughly 83% of the state’s precincts reporting – Proposal 1 was losing by a huge margin, with only about 16% of voters supporting the measure. Listen, we are on a roll, everywhere the sun shines and the winds of liberty blow. The marijuana movement is the only viable political movement in the Nation. We won Florida by 71 percent, more than Trump and anyone else combined and we did it by Plebiscite, Direct Democracy and in so doing have created the largest coalition of involved, educated and trained to bring about The Change set of citizens since the Revolution, ending the racist pot laws is just the beginning. The Democratic party is dead, they refused to support our righteous cause and lost big, the Republican party has gone the way of the Wig Party. The congress appears to be a continuous criminal enterprise using the levers of power to enrich their donors. We have crashed that entire corrupt mess and are just now becoming aware of our size, moral superiority and power. We have an Agenda, stay tuned, Let My People Grow. People constantly conned in this country. Yay FreeDUMB. True “Liberty” would mean there are ZERO cannabis or hemp laws. NONE. Decriminalize it and deregulate it or it’s nothing more than a regulation/tax scam. The exact opposite of liberty.